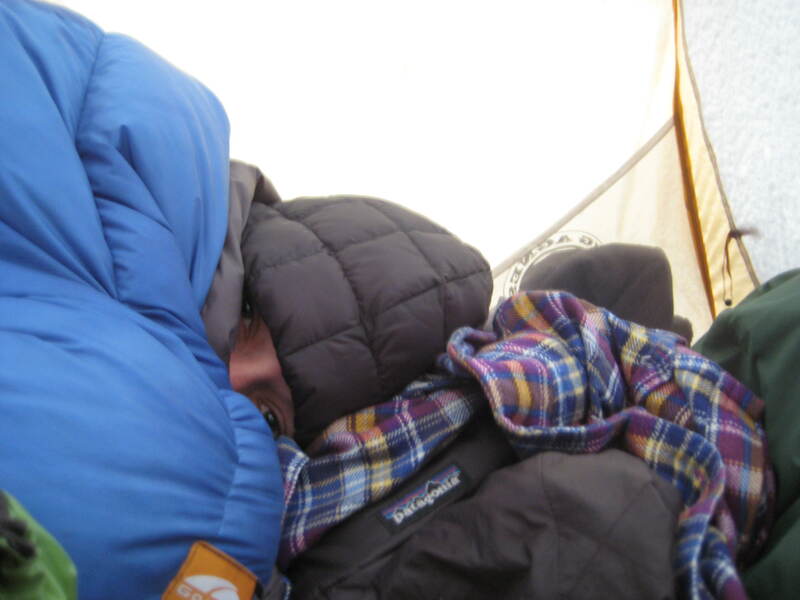 I woke up in the dark at 6am on day 8, disoriented because I could feel the tent leaning in on me. I felt around to find both sides of the tent and the vestibule had caved in on us. 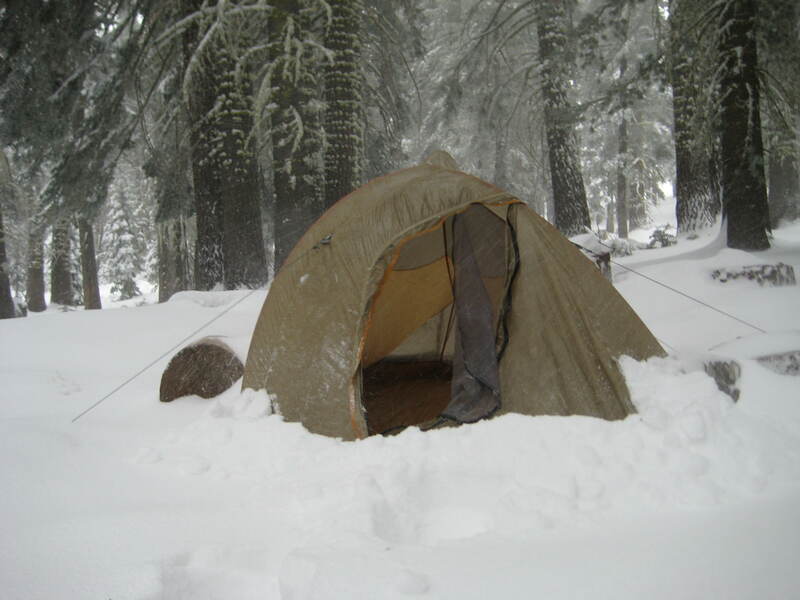 The forecasted “1 inch of snowy slush” had turned into 6+ inches of snow that had covered our tent during the night. The weight of the snow had caved in both the sides along with the vestibule, leaving both of us about 2 feet of dry tent to share. We layered up and climbed out of the tent into the storm to fortify Aggie. We brushed off the snow, staked out the tent as tightly as we could and tried to come up with a plan for how to stay dry as we waited out the storm. Emily had a great suggestion to put logs in between tent and the fly to build up some space prevent snow from coming underneath the fly. After we had bomb-proofed our tent to the best of our abilities we dove back into the tent to rewarm ourselves and try to dry out our down sleeping bags a bit. As we warmed up we had a decision to make- should we head out in the storm not knowing how much more we were supposed to get or how much visibility we would have or should we wait it out? After some discussion we decided to wait out the storm, since it was still going strong and we had no idea how much snow to anticipate. What does waiting a storm out mean in a tiny tent? Nap time! 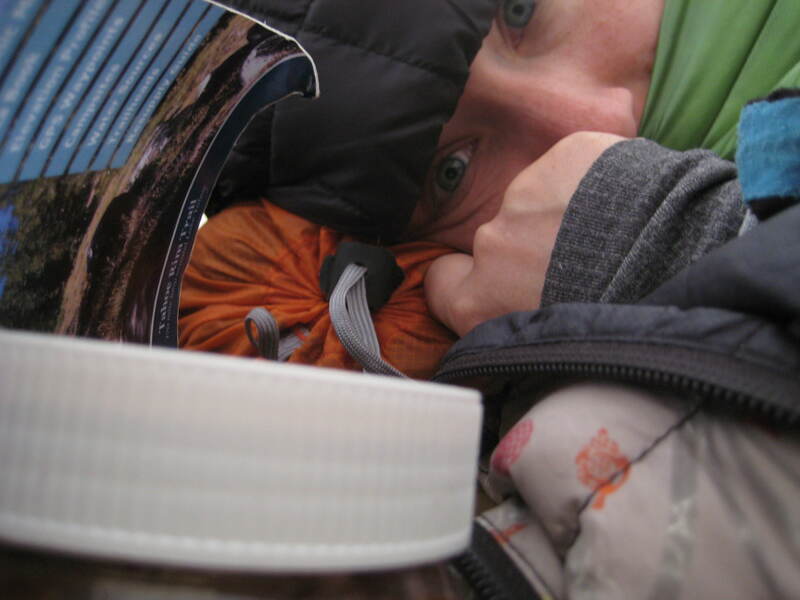 We slept through the morning and ate lunch in our sleeping bags as the snow continued to come down. The rest of the day was then a combination of napping, trying to check the weather and making sure to keep our gear as dry as possible as the snow piled up.